Mirco Antenucci, had a good goal disallowed. Three giveaway goals and a wrongly disallowed goal cost Leeds United as they went down to their first away defeat of the season at Middlesbrough. The Whites had more than double the efforts on goal as their hosts, but this was not their day as they were trailing from the third minute and played a big part in their own downfall. Middlesbrough’s first attack brought them the opening goal when Christian Stuani got round Charlie Taylor and Giuseppe Bellusci, who was restored to central defence, failed to cut out his cross, allowing David Nugent time to control the ball and fire home from close range. Incredibly that was to be the hosts’ only effort on target in the whole of the first half as Leeds kept them mostly at arm’s length without creating much themselves in the first 45 minutes. Boro did nearly add to their lead, however, when Sol Bamba attempted to chest the ball back to Marco Silvestri, but the United keeper was forced to make a flying leap to keep the ball out. At the other end, Mirco Antenucci, in for the injured Chris Wood, saw his angled shot comfortably saved after the best move of the half involving Gaetano Berardi and debutant Jordan Botaka. Middlesbrough did go two up on 32 minutes when with Silvestri coming out to deal with a cross there was no communication between him and Bellusci and the Italian defender headed the ball into his own net for a real giveaway goal. United kept going to half-time, but Stuart Dallas saw a 20-yard shot comfortably saved and Alex Mowatt sent one strike just wide and had another pushed away by keeper Konstantopoulos. Leeds came out determined to hit back after the break and Mowatt saw a well struck 25-yard free-kick tipped over. They thought they had pulled a goal back three minutes later when initially given a goal as Antenucci fired past the home keeper after collecting the ball in the box following a Berardi shot that was flicked on. 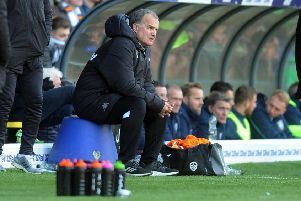 Referee Neil Swarbrick was persuaded to have a word with his assistant and the decision was changed although replays showed the Leeds player had never been in an offside position. Robbed of the goal they deserved, United piled forward again and Antenucci was free in the box, but could only send his header straight to the keeper. Middlesbrough survived and Leeds were never really a threat again as the game drifted to a conclusion. There was still time for more comical defending from Leeds nine minutes from time when Bamba slipped on the edge of his own box, presenting the ball to Diego Fabbrini, who then went round Silvestri to make it a totally unjust 3-0 final scoreline. Middlesbrough: Konstantopoulos, Kalas, Ayala, Amorebieta, Friend, Clayton, Leadbiter (Forshaw 87), Downing, Adomah (Nsue 77), Stuani (Fabbrini 59), Nugent. Leeds: Silvestri, Berardi, Bellusci, Bamba, Taylor, Botaka (Doukara 64), Adeyemi, Cook, Mowatt, Dallas (Murphy 79), Antenucci.